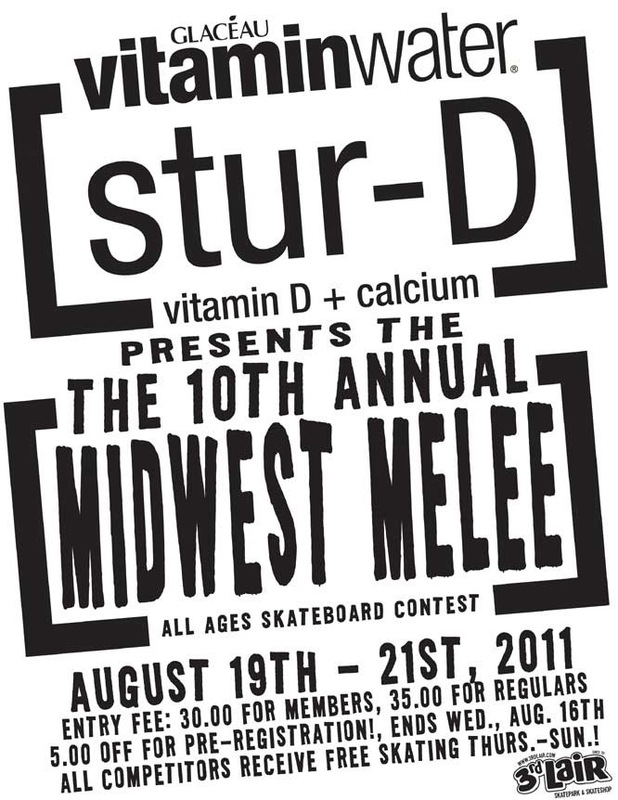 3rd Lair Skate Park of Golden Valley, Minnesota and Vitamin Water are bringing on The 10th Annual Midwest Melee All Ages Skateboard Comp. This contest gives skaters of all skill levels a chance to raise the bar and get in on one of the best skate jams of the year at the 3rd Lair indoor park. Cash is at stake in the advanced division with a 250 dollar purse and 20 session punch card for whoever takes home the cake. Trophies and prizes from Blind, Indy, Creature, Bones, Enjoi, Spitfire and more for all other divisions. Competitors skate free Thu-Sun. 35 dollar registration fee. 5 dollars off for pre-registration. Contest goes down August 19th through 21st. 850 Florida Ave S, Golden Valley, MN. Hit up info@3rdLair.com for more details.